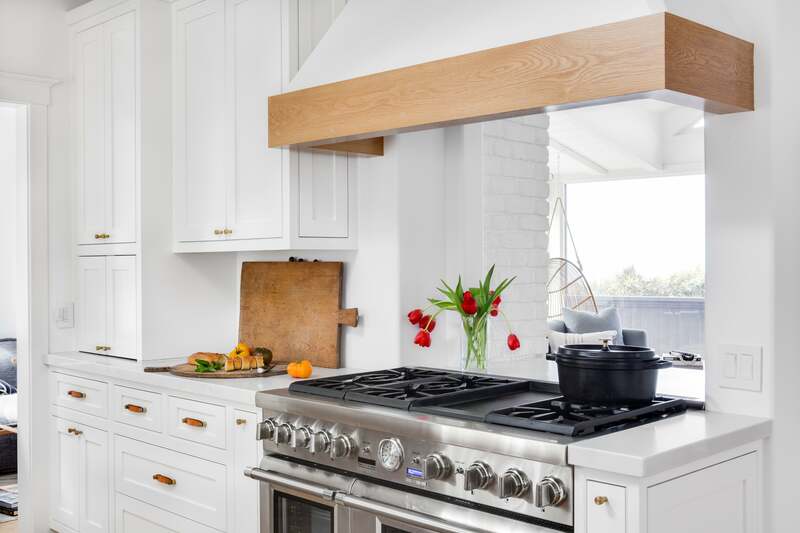 What started as a simple kitchen and master bathroom remodel quickly spiraled into a full-on home renovation. 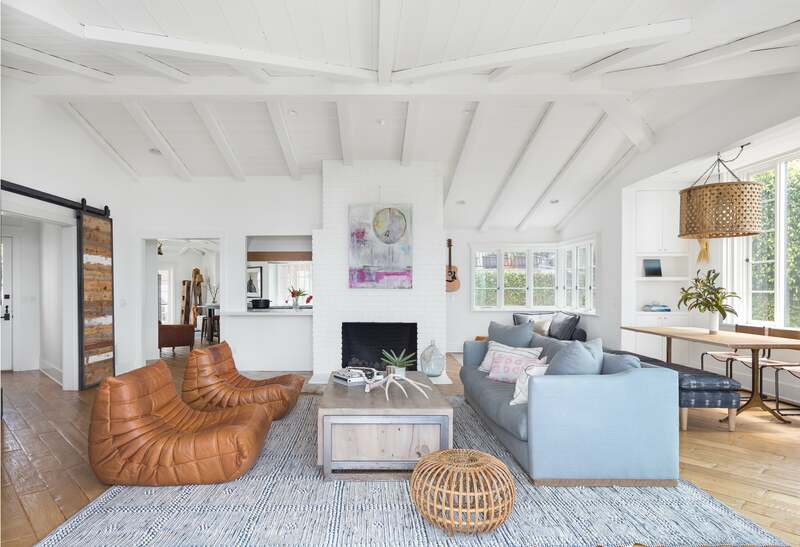 The client, an entrepreneur and single mother of two teenagers, had lived in the 3,000-square-foot Laguna Beach home for five years. 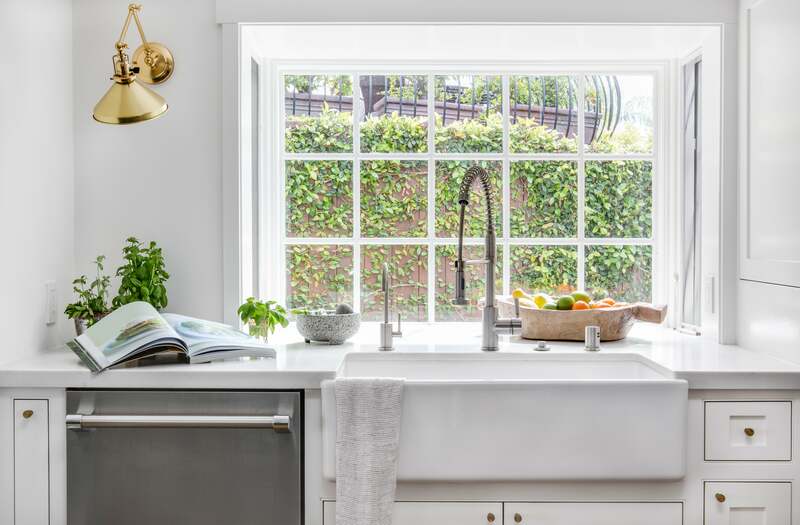 Initially, she recruited designer Tania Cassill for a quick overhaul, wanting to make a few changes before potentially selling. What followed was an extensive makeover of almost every room in the house. 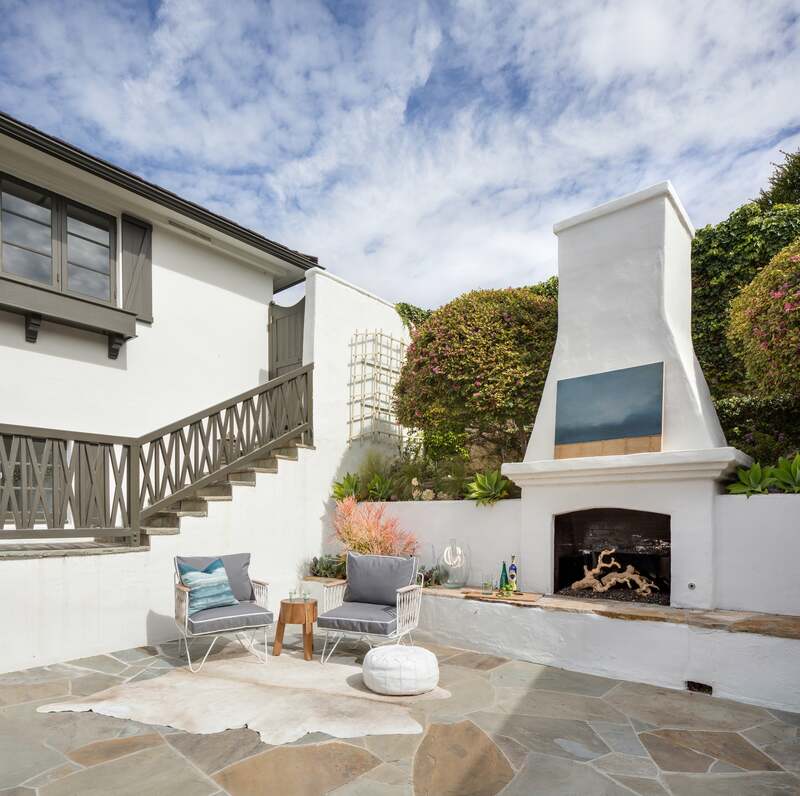 Being that the house is situated mere steps from the beach in the area’s Emerald Bay neighborhood, incorporating the sunny California vibes was a must for Cassill. This directive meshed well with another source of inspiration: the family itself. They love to entertain, so having space for communal gatherings needed to be factored into the remodel. 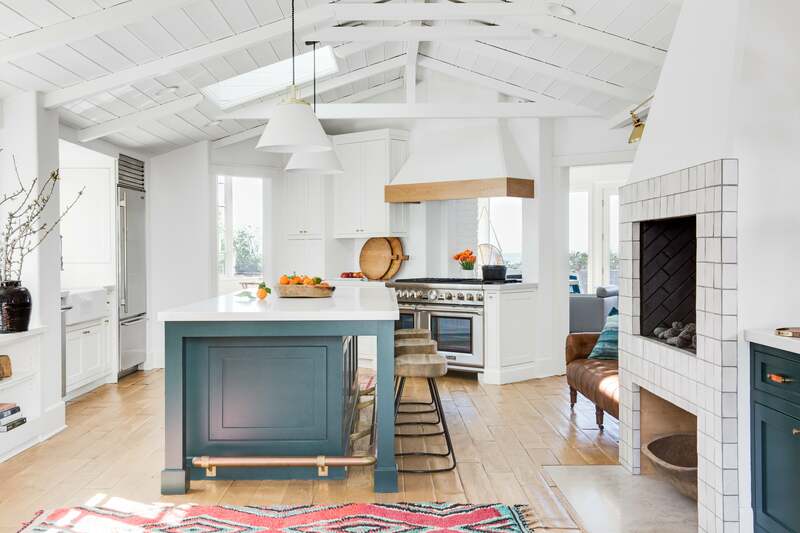 Additionally, all three are avid skiers, surfers, and volleyball players—to play off this trait, Cassill brought in natural elements that recalled the outdoors in every part of the home. There’s an enviable amount of natural light seeping into each room. 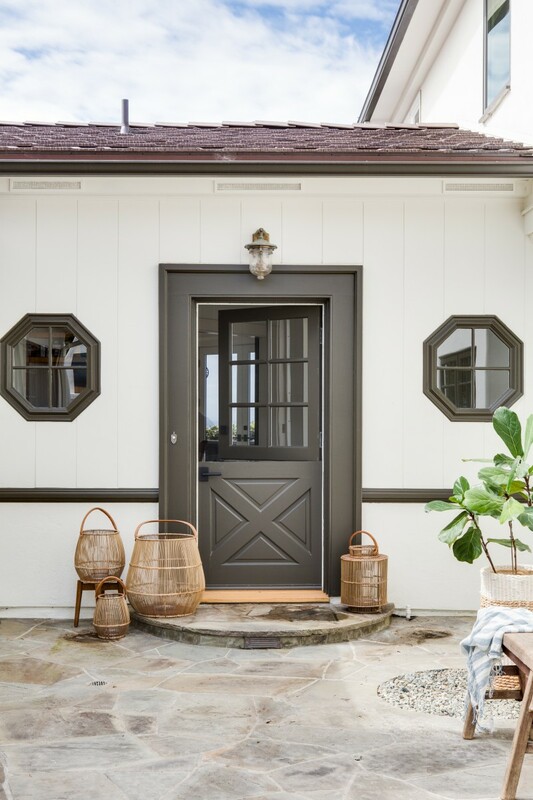 Accompanied by a whitewashed backdrop and a peppering of woven textures throughout the home, the outdoorsy Cali inspiration is definitely obvious. 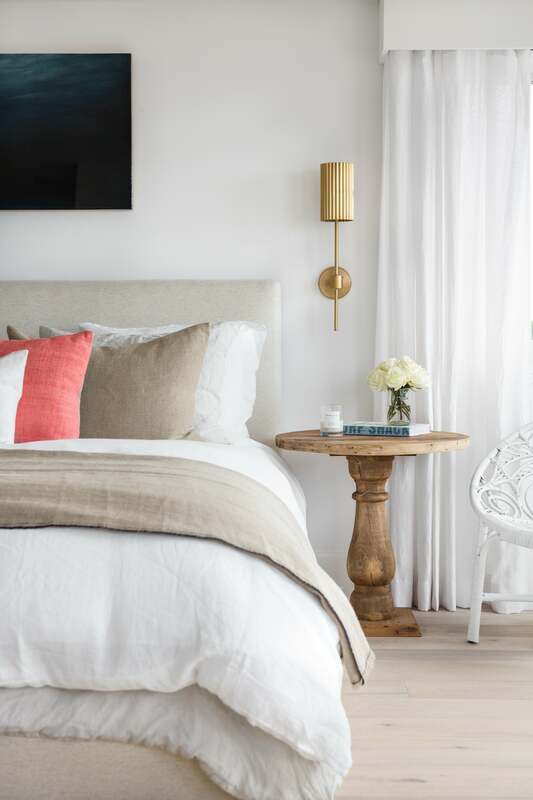 Keep reading for a behind the scenes look at how this stunning abode came together. How did you settle on a color palette? 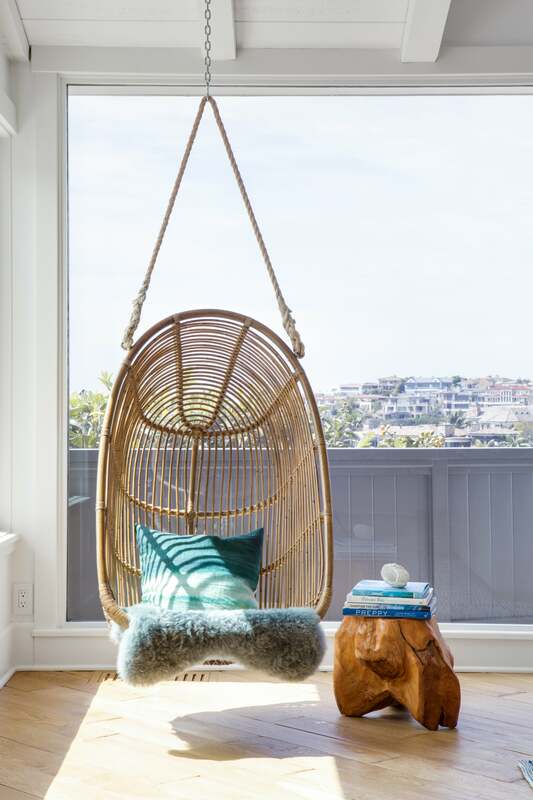 The house has a beautiful ocean view, and I wanted the interior colors to mirror nature’s color palette. Deep saturated greens, pale blues, and touches of gray all [feel] natural. The angles, both in the kitchen and her daughter’s bathroom. The range wall in the kitchen was a 45 degree angle, and the daughter’s bathroom was a narrow triangle. These angles weren’t going to change, so I needed to be extra creative. In the kitchen, we pulled the island a few feet further from the range wall, and extended the island [to create] a more balanced space with a nice flow. This eliminated the congestion that used to occur at the end of the kitchen. Between the fireplaces and shiplap ceilings, there are a lot of cool architectural features in the home. How did you play up certain key elements? The brick fireplace was hidden! It was behind a solid carved limestone mantel. We removed the mantel—not an easy task—and found the original fireplace. This was definitely a designer’s dream. The bones of the house were so good: The ceilings were incredible, but needed white paint. The floors were original, but really needed some love. The bathrooms are all such standout moments—can you tell us a bit each one’s unique look? 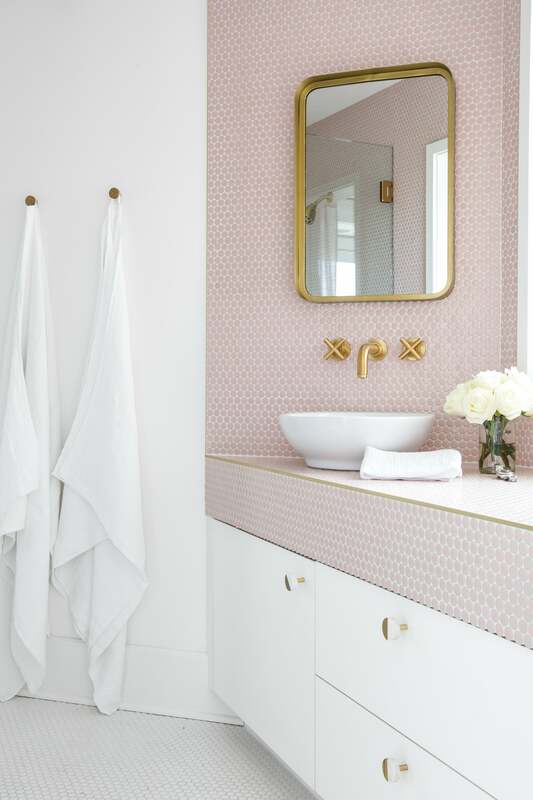 I’m not going to lie… the pink penny tile bathroom might just be my favorite! It was inspired by a tiny lobby bathroom at a boutique hotel in Paris. I love how the gold schulter (the metal trim) turns the standard penny tile in to something so elegant and chic. The black and white bathroom is the guest bathroom. 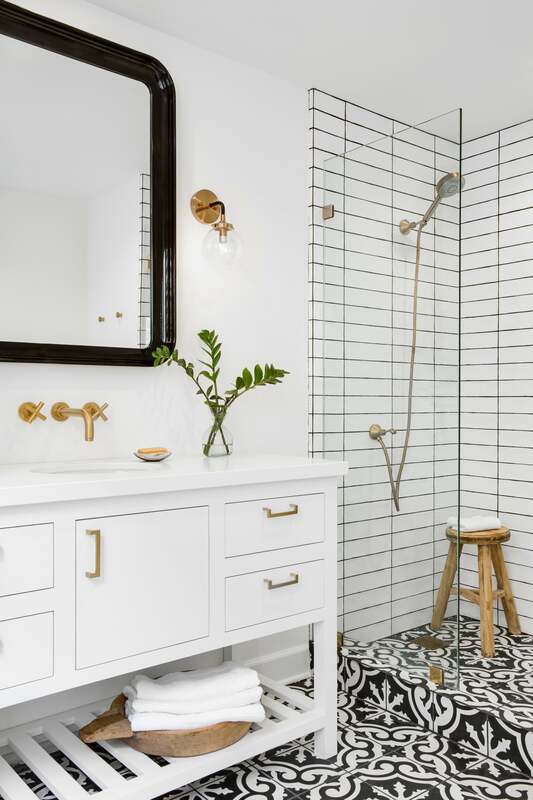 I just love the stark contrast of the white tile and the dark grout juxtaposed with satin brass fixtures. 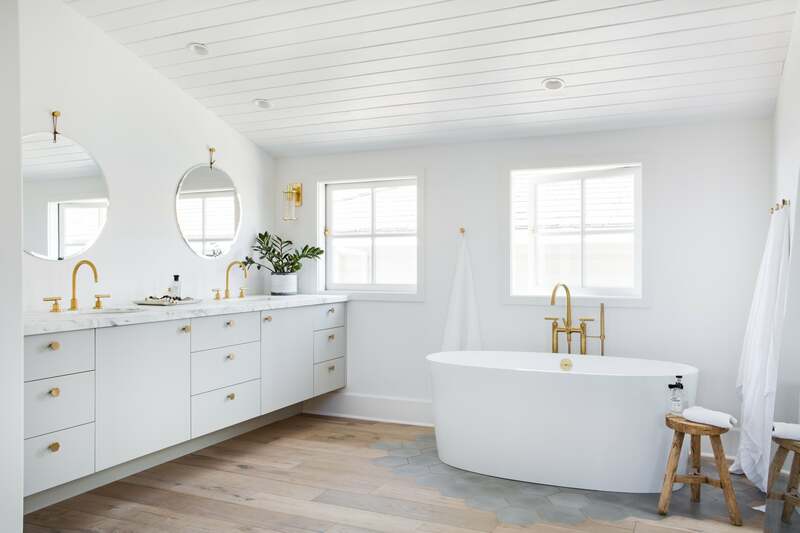 The master bathroom, which was originally divided and chopped up, was turned into one open, inviting, spa-like retreat. The surfaces needed to flow seamlessly together so the gray hexagon tile finished into the oak flooring in a very organic manner around the tub. The color story was a very soft gray and natural hue. What are some of your tips for making an outdoor space feel like an indoor living room? I think the rules for designing an exterior space have changed over the years. Outdoor spaces should be a direct reflection of their indoor counterparts with art, lighting, accessories, plants, and fresh flowers. If the space is somewhat protected from the elements, then anything goes! 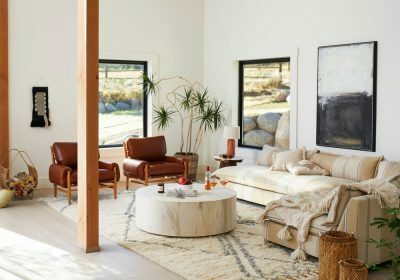 Unexpected elements, such as a hide rug or vintage leather pouf, which are traditionally only indoor items can be used outdoors during our summer months. Vintage seascapes, woven pendant lighting, textured pillows, sheepskins, maybe a cozy throw to ward off a chill in the evening. 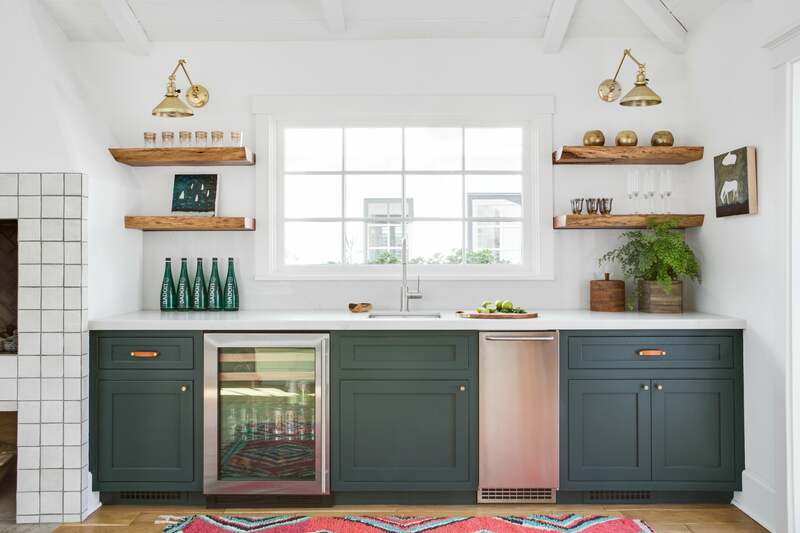 How about your tips for pulling together spaces prime for entertaining? 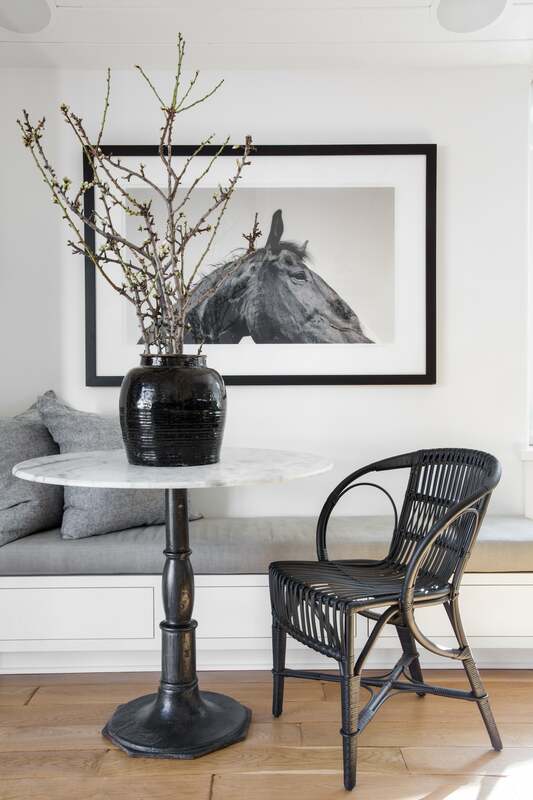 The key to creating the perfect indoor (or outdoor) entertaining space is making sure people can have a conversation. The seating and lounging areas need to have multiple places to sit, forming a perimeter, and a place to set a drink in the center. People love to congregate around something. I tend to keep the spaces smaller so they feel intimate, and offer additional pillows and seating options if needed. I love layered rugs, multipurpose floor cushions, and rattan pieces all congregating together to form a casual and inviting lounge. 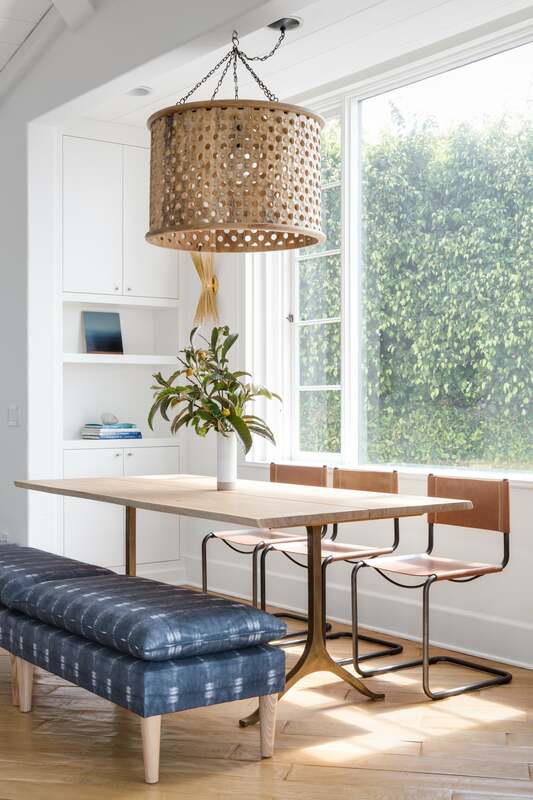 It’s important to have pieces that are versatile and can be used as seating, or even a small table.